At some stage most horses and horse owners come up against physical or temperament challenges. We have outlined how our products can help some of the more common issues encountered. We also offer additional help finding the best solution and can be contacted via email for advice. This is probably one of the most common problems we hear about. Usually they are grass related but sometimes linked with gastric issues or feeding unsuitable feed types for the horses natural temperament or metabolism. Spooky, reactive horses with unpredictable behaviour is commonly completely resolved by feeding GRAZE PLUS or a combination of COMPETE or COMPETE SF and GRAZE. This is a diamond partnership and it has resolved hundreds of our customers grass related temperament challenges. You could also partner ORGANIC PLUS with GRAZE. Both these products contain a full organic magnesium supplement as well as all the supportive minerals, and of course COMPETE has other benefits such as elevating health so remarkably horses recover from Mud Fever, Rain Scald and other opportunistic infections quite quickly, usually within 1 month. If your horse is taking longer he may well be quite deficient to start with or his feed may well be contributing to the problems. Please feel free to contact us for advice. 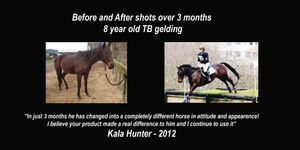 We have also seen horses bounce back quickly from a range of issues simply due to supporting the horses system and health to be able to heal themselves. ULTRA MAG is our wonderful magnesium proteinate on its own and can be successfully partnered with Graze. GRAZE PLUS contains both of these products together and ULTRA MAG is included in Compete and Organic Plus. CHILL ME is our all round calmer. Such great value. It can be used as a one off dose or daily. If you need it even stronger you can feed your usual magnesium with it, but most won't need this much help. There is no need to pay $15-20 for a calming dose. This is a very effective option for only $2 a dose! SUBMIT is a also an effective product to maintain submission and focus in horses requiring extra help in times of stress. It is very effective for mares and bolshy horses and makes them softer and more biddable in mind and body. Ideal for dressage horses! Horses can also get very edgy and reactive when they have a sore stomach or digestive upset. If you suspect this is the cause and the horse has a picky appetite or is hard to condition, GASTRO GO is a great choice. This would be the first port of call if your horse has a picky appetite, poor condition, or is grumpy/touchy around the saddle area and girth. Not all symptoms need to be present. This plus a worried, tense or fractious temperament are common signs of gastric ulceration or bacterial upset. In this situation GASTRO GO is a great choice. It contains herbs, a gentle buffer and a probiotic to replace the natural gut flora to optimum and improve hind gut fermentation. If your horse has a good appetite and good access to pasture with no history of ulceration but is just weak and lacking strength, MEGA BUILD is a fantastic choice for improving top line and muscle. COMPETE also conditions but the two can be used together or each individually depending on the level of assistance needed. Sometimes it is incredibly difficult to work out if your horse is being effected by grass or gastric upset. An educated guess considering all management variables is a great way to start and we are happy to help with this. If your horse suffers from Mud Fever, Rain Scald or opportunistic skin irritation we highly recommend Compete. Our customers routinely tell us that these conditions resolve typically within a month. Another situation where optimum nutrition allows the body to heal itself. This issue is rarely a problem with horses on either COMPETE or ORGANIC PLUS. Both these products support health from the inside out and it shows in the horses skin, coat and hooves. Organic Plus - total mineral support for the pleasure horse. Graze - our supplement to support the grass fed horse. Graze contains a registered binder for horses. Graze Plus - Graze Plus is Graze with added organic Magnesium proteinate. Compete or Compete SF - total support for the equine athlete. This product is excellent for the pleasure horse that needs a little extra support or conditioning or those prone to Mud Fever. Compete offers a level of protection against laminitis and colic as the horse is receiving new friendly bacteria into the hind gut daily and is less susceptible to these conditions often causes by bacterial die off and upset. Mega Build - builds top line and adds condition to the pleasure horse. Ultra Mag - high quality organic proteinate magnesium. Gastro Go - effective in promoting a healthy gastric system.